The USA and India can break an impasse over civilian nuclear cooperation only "if we can get the terms of the nuclear deal right," a State Department official said yesterday. About 1,000 Indians, who had entered Saudi Arabia on pilgrim visas and overstayed in search of a job, have been deported since Monday with the authorities expressing their concern over the rise in such cases. Papal bodyguards on Wednesday overcame a man who tried to board Pope Benedict XVI’s open white jeep carrying the pontiff through St Peter’s Square. Oman evacuated tens of thousands on Wednesday and closed the major port of Sohar as a weakening Cyclone Gonu roared toward the Strait of Hormuz — the world’s major transport artery for Persian Gulf oil. India has asked Russia to ease its “cumbersome and outdated” visa procedures to facilitate travel for businessmen as part of measures to enhance bilateral trade and investment ties. No trace of ecstasy was found in blood and urine samples of leading disc jockey Aqeel, who was detained at the Dubai airport yesterday, for allegedly possessing the banned drug, his lawyer claimed today. The USA has cautioned Pakistan against using the newly introduced law to curb media freedom amid a judiciary crisis which has rocked President Musharraf’s administration. Hundreds of Opposition leaders and activists were arrested in a crackdown by Pakistan government as protests against a media gag order gained momentum with petitions being filed in the apex court and provincial courts challenging the sweeping curbs. The Indo-US civil nulear deal must conform to the July, 2005, and March, 2006, agreement reached between the two countries even though there are hurdles connected with reprocessing and other Red Lines outlined by Prime Minister Manmohan Singh to Parliament in August last year. Yorkshire is all set to witness the glitz and glam of Bollywood as movie stars led by Amitabh Bachchan started arriving at the British County to attend the 8th International Indian Film Academy awards (IIFA), to be held tomorrow. State Department spokesman Sean Mc Cormack expressed optimism that the deal would move through, but admitted "these are some pretty tough negotiations." The nuclear deal is likely to top the agenda of a meeting between President George W. Bush and Prime Minister Manmohan Singh at the Group of Eight summit in Germany this week. The main sticking points that have emerged are over the US right to seek the return of nuclear technology and fuel should India test a nuclear weapon, and Indian demands for prior reprocessing rights. India is also seeking relief from provisions that prohibit the transfer of nuclear technology to India, including uranium-enrichment, plutonium-separation, and heavy water production-related equipment, except under certain narrow circumstances. While negotiators tackle these obstacles analysts say others are looming. One of these will be a decision on the fate of nuclear material the U.S. provided to for the Tarapur reactor prior to 1980. New Delhi and Washington differ on whether the non-proliferation assurances and controls contained in that 1963 agreement continued after it expired in 1993. Ambassador Dennis Kux, a retired South Asia specialist at the State Department, told The Tribune Indian "officialdom" was to blame for "missing the forest for the trees" and failing to wrap up an advantageous deal. "The Bush administration has overcome considerable, and germane, objections from the non-proliferation community, to gain Congressional approval to offer India what it has been seeking for year (first the BJP and now the Congress-led coalition), namely, access to civil nuclear technology that had been cut off by India's unwillingness to join the nuclear Non-Proliferation Treaty," Kux noted. He cautioned that if the Indian political leadership "allows the bureaucrats to continue to quibble over the trees and miss the forest that India is getting what it sought, then the deal will fall through." The US Congress, he noted, is not going to be willing to agree to revisions to the law that was so painstakingly worked out. On the testing issue, congressional sources say India "freely" struck "a bargain" to impose a voluntary moratorium on its nuclear tests. "If India tests it is a violation of that bargain. Maybe they made a mistake when they put that in. If it was a mistake they should say so," a congressional source said. Yet having worked to get the deal so far, most members of Congress will not want to see it die. The congressional source said that in the "rare case that we agree to a change it will only be a minor one. If the administration wants, we may be open to an exchange" but that would mean Congress would impose more conditions on the deal, which, the source said, India will not like. "Now is the time for the Indians to do their job," the congressional source said, adding, "There is a reluctance in Congress to do more." Ambassador T.P. Sreenivasan suggested hurdles could be cleared by changing the scope of the 123 agreement to cover a specific period. "Most of the problems are because of the perpetuity clause," said Sreenivasan, a former deputy chief of mission at the Indian Embassy in Washington and governor at the International Atomic Energy Agency in Vienna. "We oppose the perpetuity of the NPT. How can we then have a perpetual agreement with the USA?" he asked. Officials at passport department have been struggling to find them room at the deportation centre in Jeddah, which is currently coping with the rush of illegal residents taking advantage of the amnesty, media reports said. Saudi Arabia had issued a two-month amnesty, which began April 2, for those who had entered the Kingdom on Haj and Umrah visas and overstayed there. The man jumped over a barricade and tried to leap on to the back of the vehicle as the Pope was riding through a crowd of some 30,000 pilgrims at the start of his weekly general audience. 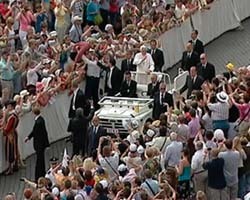 The Pope, standing up behind the driver, was apparently oblivious to the incident, continuing to wave to the pilgrims. The Vatican-watching news agency I-Media said Swiss guards immediately arrested the man, who was wearing a pink T-shirt, black shorts and a green baseball cap, calling him “mad” and probably a foreigner. Italian police told I-Media that Vatican police took the man in for questioning and would then hand him over to Italian police detailed to Vatican security. Oil prices rose amid forecasts that the strongest storm to hit the Arabian Peninsula in 60 years was barreling toward Iran. As heavy rains lashed coastal areas, authorities closed all operations at the port of Sohar and evacuated the 11,000 workers, port spokesman Dirk Jan De Vink said. Sohar’s oil refinery and petrochemical plant remained running at very low levels, with authorities considering a total shutdown, he said. De Vink said he and the other beachfront residents of the city of 60,000 were leaving their homes, all threatened by rising tides and large waves pushed by the approaching storm. Electricity went out in Muscat by noon on Wednesday, as winds of 62 mph hit the capital. Oman television broadcast footage of streets and buildings flooded with water. Health Ministry official Ali bin Gaafar bin Mohammed said rescue workers had difficulties reaching affected areas. “Even helicopters cannot fly, so it is very difficult,” he said. In the nearby Al-Amriyat town, a flood-related mudslide closed a main road. Flights in and out of Oman’s Seeb International Airport were cancelled, according to an official Hamad bin Ali al Abri. Flights that were en route to Muscat were diverted to other airports in the region, he said. “Russian procedures with regards to visas are very cumbersome and outdated. We are trying to impress on them (Russian authorities) that we must find a way to ease business travel,” India’s ambassador Kanwal Sibal said in an interview to Russia Profile magazine. Sibal, a former foreign secretary, said while Russia wanted visa-free travel with the European Union, India was only looking for easier procedures. He allayed apprehensions a liberal visa regime could be an immigration problem, saying there were very few Indians wanting to migrate to Russia and there was no common border. The scope of illegal immigration was very small, he added. Sibal noted the EU and the US had worked out systems where they were generally cautious about issuing visas, but were ready to issue visas to genuine Indian businessmen. “We want to create similar mechanism with Russia, but Russia remains unyielding. But I do not think it’s discriminatory,” he said. Sibal said India wanted an agreement with Russia for all kinds of travel, including for tourists. Aqeel’s lawyer Ashish Mehta told the PTI that his client was held with 0.4gm of ecstasy drug which was found in his bag. Musharraf, who has heavily criticised media coverage to the suspension of Pakistan's top judge, signed a decree on Monday giving the Pakistan Electronic Media Regulatory Authority (PEMRA) extra powers. The independent regulator can now seal the premises or confiscate the equipment of television and radio channels, and suspend the licences of offenders. "The Pakistan Government is going to need to come to terms with new freedoms which are emerging in the Pakistani society, concerning the freedom of expression and the media as well," said State Department spokesman Sean McCormack yesterday. "We absolutely support the growth of responsible media in Pakistan and how if this decree is used to actually shut down media, that is something we are going to watch very closely," he said. Government in Punjab province said over 300 opposition party workers were arrested. Despite the mounting criticism over the crackdown on the electronic media, the Musharraf regime is reportedly planning to extend the gag order to print media. Khan contended that in the backdrop of the judicial crisis, the amendments introduced by the president were aimed at gagging the media and depriving the people of their right of freedom of speech and expression. The Ministry of Law and Justice, Information Secretary and PEMRA have been named as respondents in the petition. The ordinance empowers the authority to take action on its own against television channels, confiscate equipment of broadcasters and seal the premises without consulting a council of complaints. The problems connected with finalising the 123 Agreement with the US is expected to figure briefly when Dr Singh meets with US President George Bush during the pull aside at the G8 Summit, along with the five Outreach countries on Friday in the Baltic Resort of Heiligendamm. Even though both New Delhi and Washington agree that the proposed 123 Agreement is important for the two countries, compromises on certain key aspects are ruled out. That adds a new dimension to the ongoing negotiations in firming up the 123 Agreement. Authoritative sources stress that India has made its position clear to the US and the ball is clearly in its court. "We can't say at this stage if the deal will go through as the ball is in the court of the Bush administration in Washington," the sources observed and said "This is a very important aspect of India's relations with the US. Even though Bush appears reluctant to approach the Congress a second time, it is hoped he will make another effort so that the Agreement is clinched rather than being left in a limbo in the run-up to the Presidential elections next year. Earlier, before emplaning for Berlin, Dr Singh noted in a statement that he would present India's viewpoint on the global issues that had been identified by the G8 for special focus, including climate protection, energy efficiency and the conclusion of the Doha round of talks. There will be 50 IIFA-related events in Leeds, Sheffield, Bradford, York and Hull during the four-day extravaganza, with an estimated 500 Bollywood personalities expected to participate, according to Sabbas Joseph, director of Wizcraft, which is managing the show.